England outclassed India to win the first women's Twenty20 international by 41 runs in Guwahati. Tammy Beaumont made 62 and Heather Knight 40 from only 20 deliveries to propel the tourists to 160-4. Left-arm spinner Linsey Smith took two wickets in two balls to help reduce India to 46-5, the hosts eventually limping to 119-6. England will have the opportunity to seal the three-match series in the second game on Thursday. After losing the one-day series 2-1, England were always likely to be more at home in the shortest format. And, against the team they beat in the semi-finals of the World T20 in November, Knight's team were superior in every department. Their performance was all the more impressive given the players they had unavailable. Sophie Ecclestone has returned home with a broken hand, fellow spinner Laura Marsh has a side injury and wicketkeeper Amy Jones was ill.
On top of that, medium-pacer Georgia Elwiss has been ruled out of the remainder of the series and the subsequent trip to Sri Lanka with a stress fracture of the back. England have a powerful T20 batting line-up and they were once again given a strong start by openers Beaumont and Danielle Wyatt, who added 89 in 11.3 overs. Apart from opening bowler Shikha Pandey and leg-spinner Poonam Yadav, India's attack struggled, while Smriti Mandhana, captaining for the first time in place of the injured Harmanpreet Kaur, often looked panicked. Beaumont played flicks, sweeps and lofted drives, and was joined by Knight after Wyatt and Nat Sciver fell in quick succession. In one over from pace bowler Arundhati Reddy, Knight hit five consecutive boundaries, including three aerial drives over extra cover. Beaumont and Knight added 68 in six overs and, even though they both fell as part of the late charge, lifted England to a total that proved to be more than enough. India were actually given a boost by England at the beginning of the chase - twice the tourists conceded five wides as Beaumont, standing in for Jones behind the stumps, endured a tough start. But she improved quickly, first diving to take Harleen Deol off an inside edge, then playing her part in Smith's decisive impact. With her second ball, Smith had Mandhana hole out to long-on and, from the next delivery, Beaumont took a smart catch down the leg side to remove Jemimah Rodrigues. Then, veteran batter Mithali Raj miscued Kate Cross to Knight at extra cover and Veda Krishnamurthy chipped Anya Shrubsole to mid-off to leave the home top order in tatters. India rallied to bat out their overs, giving some cheer to a noisy crowd, but England's efficiency with the ball and sharpness in the field squeezed the life out of the contest long before the match was done. 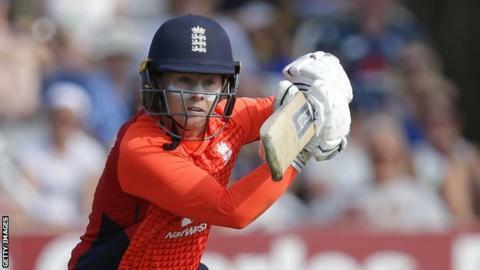 England opener Tammy Beaumont told BBC Sport: "I thought halfway that we were maybe 10 or 15 runs short, but it was a brilliant team performance. Everyone stuck their hands up after a challenging 48 hours. "Coming to T20 was a fresh start. Maybe we're more at home against India in T20s, but in general we're still pretty happy with how we go in ODIs. "I was a little bit apprehensive getting the gloves back on, but I'm happy with how I went in the end. Let's hope Amy gets well soon so we can have our world-class keeper back." Ex-India seamer Snehal Pradhan on BBC Test Match Special: "India have some serious batting concerns. Not the best start under a new captain and new coach, they've got to work out how to deal with the absence of Harmanpreet Kaur. "There is a considerable gap between the two teams at the moment."